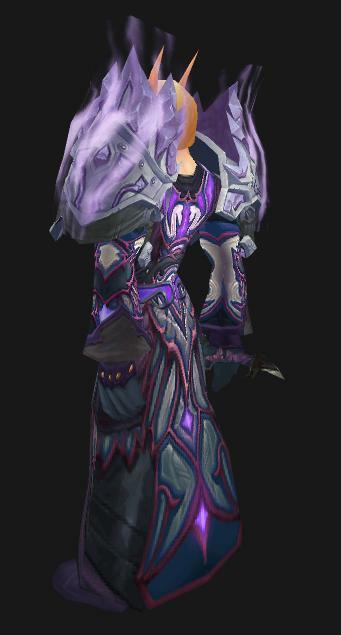 transmogrify me! | An exploration in the worlds of customization. An exploration in the worlds of customization. Had a busy weekend again. I do have good news though! Blizzard has announced the next expansion for WoW, called Mists of Pandaria. We get a new continent, race and class. That new class? The Monk! 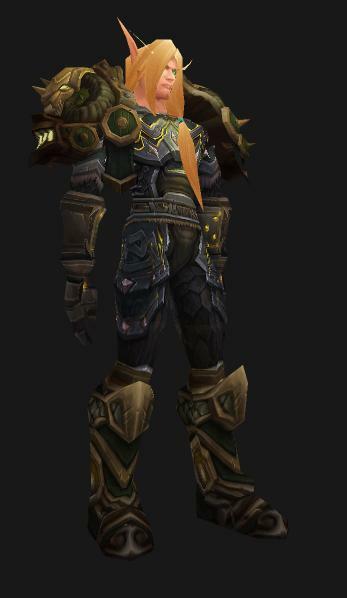 Since Monks will be wearing leather its actually a bit more exciting to see what sets I can come up with. Hopefully I will have one up soon. I just updated all the old posts to a new format for image. Instead of the normal gallery style I have been using, I now will post full size images. Hope you like that change. Now here is a set i made for you warriors out there. 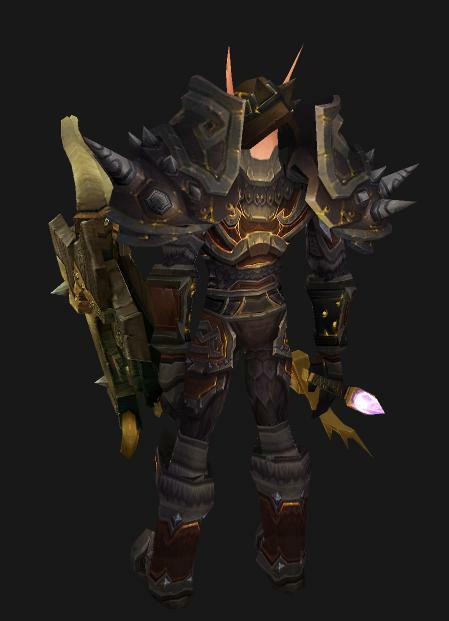 Only you can use the spiky shoulders we see here. Its just that. 1 Item makes this idea yours you special shield wearing tanks you! 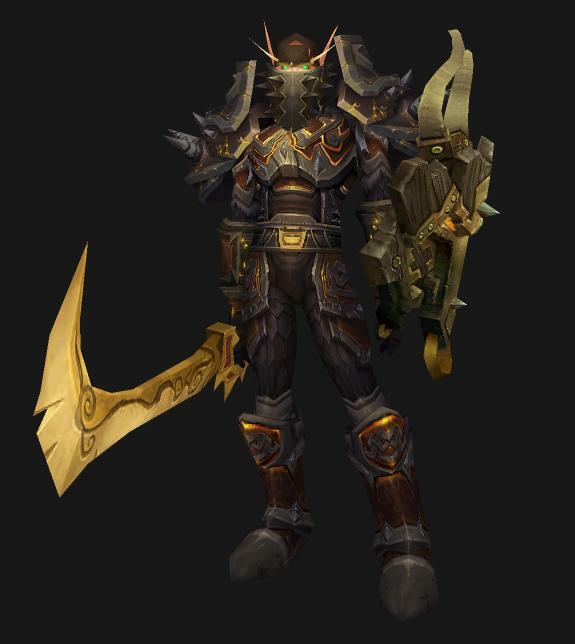 OK, fine… I have a set with no class specific gear. Similar, but not perfect It was the beta for the above idea. Its the last two images. 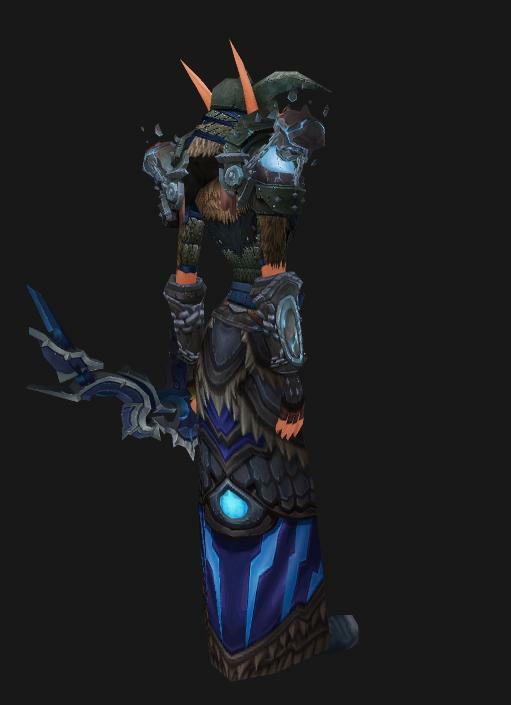 Are you happy paladins and death knights? Here are both set, including weapons and shields. I like the idea of hunters in a robe like outfit. 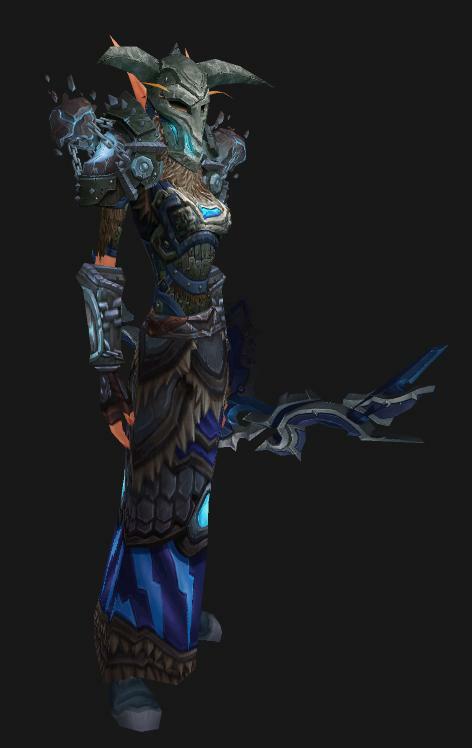 For those who don’t like the look of the robe, Ive included matching legs and boots. Though this removes a little creativity to a mach up of tier 8 and 5 man sets. 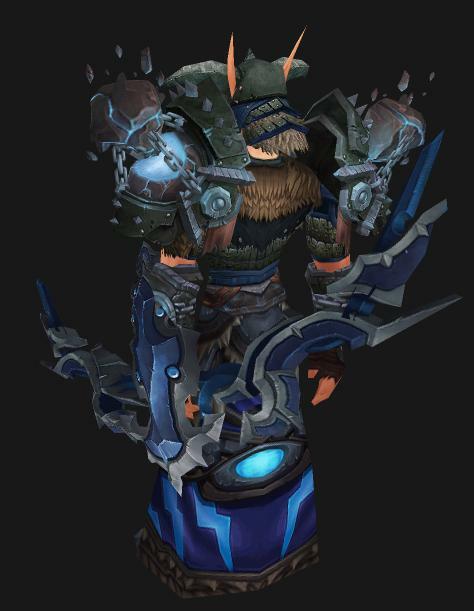 None of the items are class specific so shamans can use this was well, baring the bow of course. 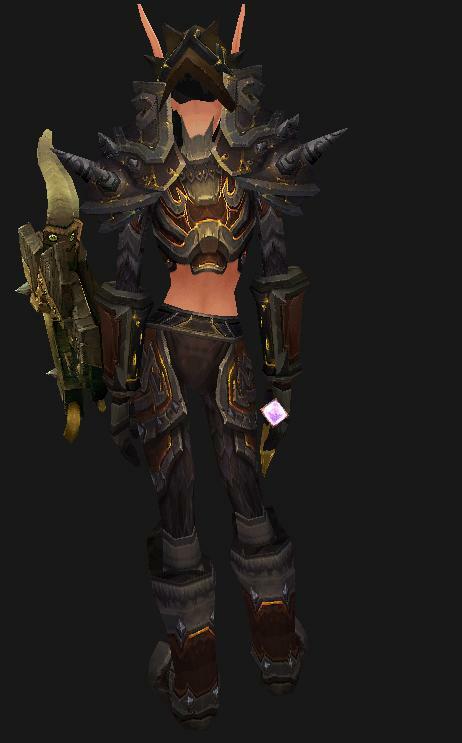 PS: Yes, i know the bow shows in the images is currently unobtainable. It matched the best and there are sure to be some people who still have it. 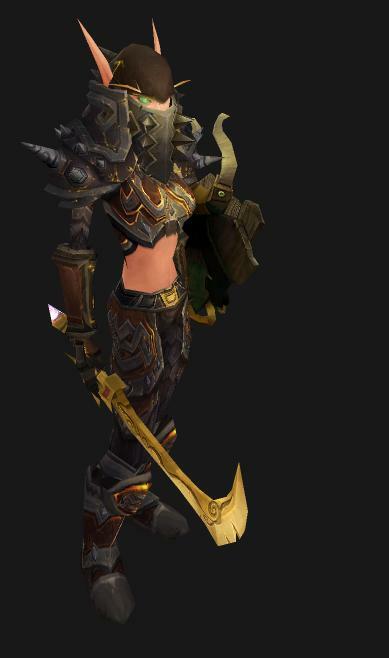 Hopefully old pvp items like this are reinstated for transmog purposes. This set can be found here. Like usual I only include items that show a visual and some weapon that match. As a warning, some gloves and wrists may bunch up the sleeves. 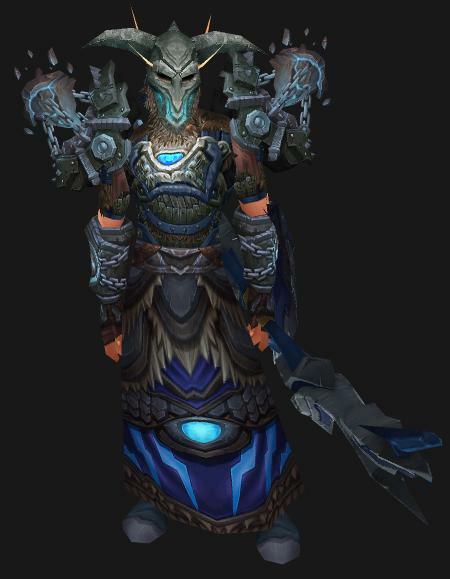 Feel free to add a head item, I thought it looked better without one but that’s my personal preference. Sorry for the lack of posts this past weekend. I have been busy with school and that, sadly enough, comes before WoW. But I do have something you guys can look forward too. Well, its more a question. Here are some upcoming posts. If you like 1 more than the others be sure to comment and it may come out first. Unfinished sets you can work on yourself. 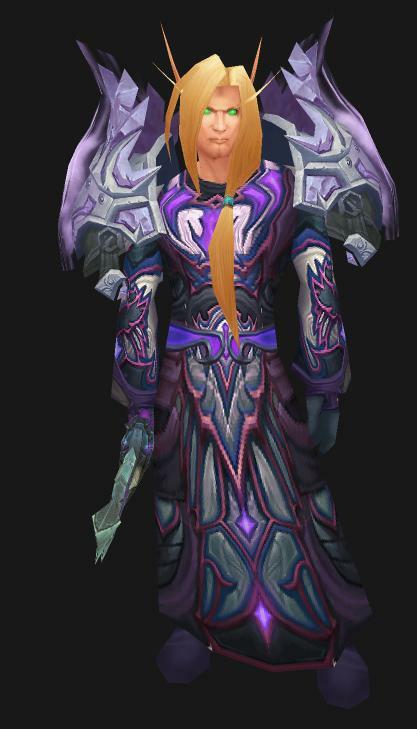 Before you all go, remember to send in an email if you want to show of your own transmogs, have idea, or have something funny to share at transmogme@gmail.com ! The 4.3 5-mans bring us some pretty good looking gear. 2 items that stand out are Treachery’s Bite and Fanged Tentacle. What is so interesting about these items? Well as it turns out, they don’t only look like spikey tentacles, they move like them! Thats right, these weapons are animated to undulate and move around! The animation isn’t as spastic as some of the tenticles we’ve seen before though, making these guys seem a bit slow. But hey, you still get to stab people with tentacles. PS: Casters, while it may take you a lucky greed role to get the sword, there happens to be a spell dagger using the same model as Fanged Tentacle.